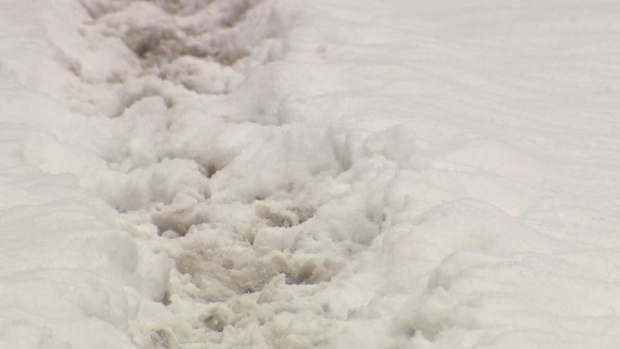 Which Metro Vancouver cities have the strictest sidewalk clearing rules? A snow-covered sidewalk is seen on Tuesday, Feb. 12, 2019. Wondering how soon after a storm your sidewalk has to be cleared of snow? It depends where you live in Metro Vancouver. Vancouver - All property owners must clear snow and ice from sidewalks bordering their property by 10 a.m. every day. West Vancouver - Owners have 24 hours after the end of a snowfall to clear snow and ice. City of North Vancouver - Owners have to remove snow and ice "as soon as possible" after snow has stopped. Burnaby - Snow must be cleared before 10 a.m. every day, including holidays. Coquitlam - Owners have 10 hours from when the snow ends. Maple Ridge - Sidewalks should be shoveled as soon as possible and no later than 10 a.m.
Langley - Owners have 24 hours from the end of a snowfall, or before accumulation exceeds 10 centimetres, and they have to take snow off any roofs that hang over the road or sidewalk immediately. Surrey - Owners have until 10 a.m. the day after a snowfall. New Westminister - Sidewalks must be cleared before 10 a.m. the following day. Richmond - Owners have until 10 a.m.
For more details or information on other cities, call 311 or visit your municipal government's website.